Two Ohm Hop is a joint effort between friends David Willingham and Philip Croley. David Willingham is a well known Texas studio engineer (having worked on several of the two Ohm Hop releases), and Philip Croley is the former booking agent of the Argo in Denton TX, the home base of the Texas spacerock scene for several years. Two Ohm Hop started in the fall of '97 with the release of the Wayward Son 12". 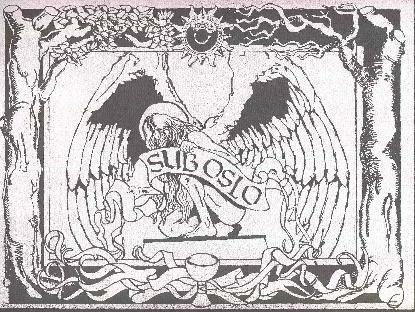 The Following year (spring '98) saw the release of the Sub Oslo EP, Light Bright Highway LP, and the Stumptone 7". All on vinyl, all released at the same time. The intention was for the first four releases to be on vinyl and be a limited edition run of a 1000 each, never to be repressed. In the fall of '98 the Frankie Teardrop 7" was released featuring Doug Ferguson of Ohm. The future holds several new releases for the Two Ohm Hop label. The Stumptone Full-length CD is scheduled for June '99, and Sub Oslo is in the finishing phase of releasing their own Full-Length CD which should be ready by sometime mid-Summer. It looks like Two Ohm Hop will be releasing a full-length live Sub Oslo CD this fall, possibly to be recorded at the Ridglea Theater in Ft.Worth in late Summer. A Full-Length CD by the Denton based group Mandarin, and a split Man's Ruin (Frank Kozick's label)/Two Ohm Hop release of Light Bright Highway. Both Light Bright Highway and Sub Oslo will be touring the West coast this fall with Light Bright Highway also hitting the East coast and scheduled to play the Strange Daze '99 SpaceRock Festival. For more information on the label and the music reviewed below, you can visit the Two Ohm Hop web site. Light Bright Highway - "Moon Glory And The 7th Sun"
Light Bright Highway are an improvisational guitar, bass, drum trio that play what I would describe as ambient textural psychedelia. On the one hand, it's not far from the earliest Pink Floyd space explorations. On the other, though, the effect the music has is more like that produced by dreamy electronic soundscape music. From Denton, Texas, the trio includes Robbie Dwyre Jr on guitar, Trinidad Leal on drums, and Curt Christenson on bass. "Moon Glory And the 7th Sun" is the name of the album as well as the title of the album's one and only track recorded live as it happened with no overdubs. Ok, so we've got one instrumental track over two album sides. As you might expect the music develops veerrrrry slowly and after a number of listens I can tell you that the best way to enjoy (or decide you don't enjoy) Light Bright Highway's music is to set yourself down in a comfortable chair, get very relaxed (with help if necessary), and dim the lights. The first several minutes consist of lightly strumming, slightly droned guitar. The guitar is soon joined by the bass and drum and the volume cranks up unexpectedly, though not in an abrupt manner that jars the listener. Things get extremely cosmic and the intensity builds to frantic levels, though it often eases just as quickly as it begins. Despite the aggression levels that Light Bright Highway can reach, they maintains a soothing sense of melody and the atmosphere is one of beautiful noise. Sure, there are moments when the guitar produces harsh, ear-splitting sounds, but they are brief and the listener is gently eased away from them. Of course the band does have to deal with the fact that an LP has to be flipped over to side two, so the they come in for a landing allowing the listener to return briefly to reality and turn the album over. The music starts over in a sense with a new laid back introductory segment which soon develops into alternating segments between sporadic wailing space guitar and more melodic bits. Much of side two is even more close to spacey electronic music and during some parts I had to remind myself there are no keyboards. If side one is the lift off and blast into orbit, then side two is the journey to the furthest reaches of space. Music that is improvised at length doesn't always work consistently and I'm sure Light Bright Highway falls victim to this at times themselves. But if this debut album is any indication, I'm sure they are well worth experiencing live. In the promotional material for the album the band continually stress that they are strongest as a live band and indeed I'm looking forward to seeing them perform in August at the Strange Daze '99 SpaceRock Festival. DUB is a type of remixed Reggae music, and Texas-based Sub Oslo plays a DUB style with a great groove and that often gets quite a ways out into space. The band consists of Miguel Veliz on bass, Quincy Holloway on drums, Frank Cerbantez on guitar, John Nuckels on dub mixing, and Moses Mayo on percussion. The album includes three tracks in the 10-minute range, though these are considered short compared to the 20-30 minute songs the band typically plays live. This is actually the first DUB album I've listened to closely and my impression is that the Reggae influence is present mostly in the beat and rhythms. The beat is toe tapping but in a valium-paced way. I found myself really grooving to the music but not exactly wanting to hit the dancefloor. "Prisoner Of Dub" features a psychedelic guitar style that, even when it becomes a standard Reggae style, still retains a trippy quality. The bass is so low-end that I could feel it thudding in my chest. The guitar often got to the point where I thought it would go into an acid freakout but it stops just short of that so as not to overshadow the all-important rhythms too much. "Science Dub" is a very subtle but cosmic tune. The trademark groove is established but all kinds of trippy synth work is darting about in the background (is that the DUB mixing?). "Dubaliscious" is similar, but as the tune progresses we're treated to various aliens-from-space voices and sounds and way-out effects added to the percussion. Sub Oslo explores the cosmos in Jamaica to produce a psychedelic tribal groove. And it all ends as an electro-space noisefest. Rasta-Krautrock? Aliens with dreadlocks? If this is typical of DUB music than I'm game to hear more. Nothing complex or intense about it. Just a great trippy groove that conjured up images of paisley Kaleidoscope Rastamen. Frankie Teardrop - "Electro-Acoustic Rollercoaster Ride" b/w "Aphrodite's Lullaby"
Frankie Teardrop is keyboardist Doug Ferguson, perhaps known to AI readers from his work with Ohm, Vas Deferens Organization, and Musik Von Tone Float. 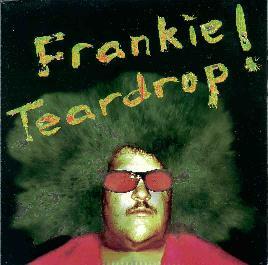 This is apparently the first of more planned releases as Frankie Teardrop. "Electro-Acoustic Rollercoaster Ride" struck me as a Tangerine Dream meets the Residents electronic... umm... rollercoaster ride. There are several layers of electronics, a couple of which are unsettlingly pulsating. Things get quite intense and a mind numbing drone paralyzed me and commanded my attention. I was paying attention!!! Ya didn't have to hurt my brain!!! "Aphrodite's Lullaby" starts with several of those numbing drone synth lines giving it an orchestral quality. The melody really does make for a kind of avant garde lullaby feel though I picture Aphrodite being the female doll in the last Chucky film. Now guess what... I wrote the last paragraph after having listened to the record several times at 45 rpm, not realizing it's a 33 1/3! And hats off to Doug for creating - if unintentionally - music we can enjoy at both speeds. And after listening to it now at it's "proper" speed I don't feel I need to change my review, but I will add that the music on Rollercoaster Ride is much darker and has an eerie slow-paced intensity that I enjoyed. Lullaby is much the same but I take back the Chucky chick comment as the tune played properly has a more majestic quality than I heard before. Interesting stuff but with only two tracks it left me wanting more. Hope the next one is a full length. 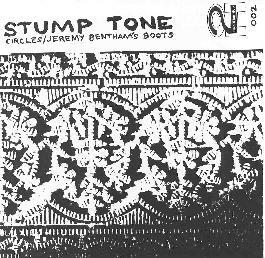 Stump Tone - "Circles" b/w "Jeremy Bentham's Boots"
The promo material for Stump Tone says that the band has gone through many lineup changes, existing at times as a solo act, and at others with up to eight members. I guess this has caused confusion because the promo sheet lists a trio consisting of two different members than the disc sleeve does. So going with the disc sleeve the band includes Chris Plavidal on guitar, moog, rhodes, tapes, and vocals (he's the common member), Chris Veon on bass, and Quincy Holloway on drums (also with Sub Oslo). Speaking of confusion, I can't imagine two songs being more different from one another. And I can't tell which side is which song. But that doesn't matter. One side features a VERY well done pop-psych tune. It's got a great dual guitar sound, freaky backwards Magical Mystery Tour style loops, and a solid catchy melody. One guitar is very soaring and gives the music a cosmic edge. The rhythm guitar has a dirtier sound and contrasts nicely with the first. The other side is an acoustic solo song that sounds like a long lost Nick Drake recording. Both are good but I'd love to hear more stuff like the first tune. Wayward Son - "Sometimes I Get Down" b/w "Never Forever"
Wayward Son is the solo project of Texas-based Christopher Ryan who began as a DJ and decided to include those talents when he made the transition to musician. I've not had much exposure to hip hop music, but this was a pleasant surprise. On "Sometimes I Get Down", a hip hop beat provides the background for ambient landscapes and a trance inducing horn melody. "Never Forever" is an even better tune with spacey shooting star synths and a cool groove, which still has a bit of the hip hop beat. The horn sound that played the melody I liked on "Sometimes I Get Down" is still here as well. Both songs repeat their basic themes throughout and don't change a whole lot but I enjoyed the mood and atmosphere of the music and think Ryan has done a lot with the simple melodies he's created on each tune.